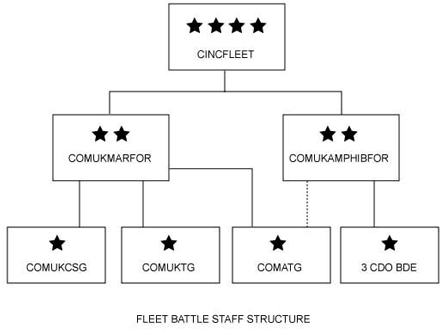 The Fleet Battle Staff are currently one of the world's most advanced military planning departments, capable of commanding large multinational naval and marine task groups anywhere in the world. In today's ever-changing environment the Royal Navy and the Royal Marines, are required to operate in many different operational areas. Some of these tasks would include: deep sea (blue water) warfare, amphibious warfare, humanitarian aid and non-combatant evacuation operations. All of these require careful planning, co-ordination and execution. The Fleet Battle Staff provides the UK with this core tactical maritime expertise, which can be adapted to wide variety of situations. The FBS will regularly command task groups, often using the latest 21st century computing technology. Based in two main headquarters in Portsmouth and Plymouth, the operational commanders and their associated staffs combine to design and develop the maritime aspect of every operational plan. In times of conflict, or when conducting exercises, the staff will usually be found on board an RN ship using the ship's advanced communication systems to direct the task force. Furthermore, when necessary, elements of the staff will move ashore to see the final phases of the operation through to its conclusion.